The BT Vision+ set-top box is a combined Freeview receiver (for 40 channels of free-to-view TV), digital video recorder, and an Internet-connected box that can download TV content and movies over Broadband. 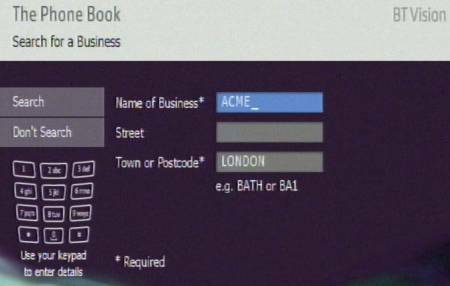 On this page, we’ve got a collection of screenshots of BT Vision in action, as well as detailed specifications on the BT Vision set-top box. We hope to be able to answer all of your questions. The v-Box is offered to BT Total Broadband customers that sign up to BT Vision. It supports Ethernet and USB connectivity. To get a BT Vision box, you need to be on BT Broadband. In most cases, the BT Vision box is available for free when you sign up to BT Vision. 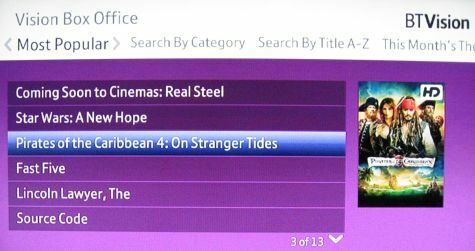 BT Vision launched a revised version of the original set-top box in December 2009. This new box sees a colour change from grey to shiny black. Some were expecting the second version of Vision V+ box to support DVB-T2 (needed for Freeview HD), but this one doesn’t. What is does offer is a slight re-design, a new colour, and some changes to the components to make the box a reported 12% more energy efficient. In 2008, BT announced that Motorola would replace Philips as manufacturer of the Vision boxes, so this new box may by a Motorola – we can’t confirm that at this stage. No engineer needs to visit – the box is couriered to you, and you connect it yourself. A TV aerial feed – The BT Vision box gets its digital TV signals over-the-air, so needs a TV aerial. This needs to be connected to the aerial input socket on the V-Box. There is an output RF aerial socket to allow you to connect an aerial feed to a TV if required. 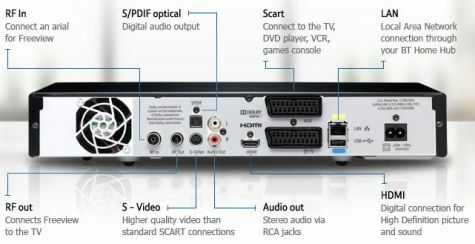 SCART lead – You need to make a connection from the Vision+ box to the TV using a SCART lead. If you have an HD TV set, you can also connect via an HDMI lead (not supplied). The most common way to make the connection, is to connect an Ethernet (networking) cable from the BT Vision+ box to one of the Ethernet ports on the Home Hub. If you can’t make a direct connecting to the Home Hub, you can use Powerline Adapters to make the connection. The self-install kit includes two Powerline adapters to allow you to connect to the Home Hub if it’s in a different room to the BT Vision+ Box. The BT Vision v-box has an additional SCART socket, which can be connected to a video or DVD recorder. Connecting to an existing TV/Video system: The BT Vision v-box connects into an existing home TV system in a similar way to other Freeview set-top boxes. If you need guidance on connecting SCART leads, use our Connection Advisor (Select ‘Set-top box with 2 SCARTs’ to represent the v-box). Connecting to other TV sets in the house: If required, you can feed the output of your BT Vision+ box to other TV sets – the box has a modulated output, so you can use a standard aerial cable. You can also use a wireless AV sender. The BT Vision Box is designed to work when connected to a BT Total Broadband enabled phone line. The box and service have to be activated by BT before you can use BT Vision, and BT has to associate the box and service with your BT Home Hub. Ordering a BT Vision Box To use BT Vision, you need to be signed up BT Broadband. You’ll be provided with a BT wireless Home Hub, which you’ll need to get the BT Vision service. Details of BT Broadband at www.bt.com/btbroadband. RF Modulator Grey box: The first version of BT Vision V-Box has a modulated output, so it can feed TV sets that don’t have a SCART socket. This is initially preset to Channel 36. This channel number can be changed by going to Settings > General Settings > RF Output Channel. Black box: The new-look BT Vision box released in December 2009 does not have a modulated output. If you need to connect to a TV in a second room, consider an AV Sender (wireless), or an RF modulator (wired). Error V02: Purchasing failure – VOD (Video On Demand) Server not online. Problem at BT’s end? Error V04: VOD interrupted. It seems that this is a general catch-all error message. If you get it straight away on trying to watch Video On Demand, then it may be a line-related issue. This could be a drop in Broadband line speed, a drop in QoS (Quality of Service), or an incorrect setting somewhere. If this happens part way through watching Video On Demand, then it could be line / QoS performance / server congestion or a VOD file problem. Error V05: Digital Rights Management issue. We understand that this is normally a minor Server glitch, and the advice is to try again in five minutes. Error V07: Server issue. We understand that this one is only likely to show if a major problem at the BT Vision server-end, and that it’s a case of trying again later, once the problem is resolved. Error R04 / R06: On one occasion, we were trying to set a series link from the Programme Guide, and were presented with “Currently unable to record. Error R04”, followed a few seconds later by an “Error R06”. Trying to do other things afterwards brought up other errors: Attempting to delete an old recording brought up “Error R02”, then “Error R06”, and trying to get into BT Vision Help brought up “Error P01”. Something similar has been seen in our forum. A diagnostic reviewed no problems, and showed that we had a solid Internet connection. BT Vision box won’t start up We’ve seen this one ourselves, and have had similar reports from a couple of other users – the BT Vision box fails to start up. The first light shows yellow, and you may also have a red light on too. From what we’ve observed, this indicates that the box can’t start up correctly, as it’s unable to get a connection to the Home Hub. Check your connection between the BT Vision box and the BT Home Hub. Our problem was caused by the HomePlug devices – that connect between the box and the Hub over mains wiring. If you’re getting this problem using the mains plug network connectors, re-sync them and make sure that they are working correctly and allowing data to pass between the BT Vision box and the Home Hub. Alternatively, try a direct ethernet connection between box and hub. Vision box is noisy We’ve had comments from some BT Vision users about their boxes being noisy. Unfortunately, the BT Vision+ boxes are not completely silent, even when they are in standby, and they can be heard when the room is quiet. You’ll find this with most PVR devices such as the Sky+ boxes and Top Up TV Anytime boxes too. The reason for this is simple – Most hard-disk recording boxes, including the Vision+ box, contain a computer processor, a hard disk, a power supply and a cooling fan – much like a desktop or laptop computer. Whilst your DVD player or cheap Freeview box are in general quiet, a hard-disk recorder is working harder and is often powered on all the time, so tends to run hotter – it therefore requires more cooling. What you’re able to hear, is the box hard disk running, and the box cooling fan keeping the temperature under control. SCART / Coax output not working We’ve found something of an odd problem, but we’ve solved the mystery – at times, we were finding that the SCART and co-ax output from the BT Vision V-Box weren’t working. We traced the problem to the HDMI socket. 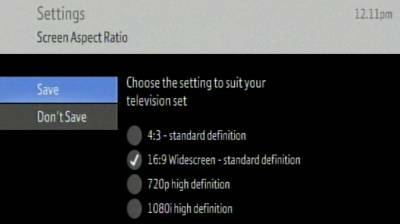 If you have an HDMI plug connected to the high-definition socket, and/or the BT Vision+ box set to output at 720/1080 (Hi definition mode), then the SCART and Co-ax outputs are disabled. Simply pulling out the HDMI plug solved the problem, but it’s not an ideal fix. If you need help getting the remote control to change the TV channel or adjust the TV volume, see the FAQ below. First, refer to the series of remote control codes at the back of the “V-Box Installation Guide” and find the 3 digit code for your telly. The blue light should flash 3 times. Lost your manual? Can’t find a suitable code? Need more help? Ask in our BT Vision forum. Include the make and model of the TV you’re looking to control. Power The BT Vision box is mains powered – The box has two states “on” and “standby”. To watch TV, the box must be “on”. To record programmes and get software updates, the box must either be “on” or “in standby”. The BT Vision box requires connection to the BT Home Hub, which must also be powered in order to get on demand TV content, software updates and the Electronic Programme Guide. Power consumption The BT Vision box manufactured by Philips requires around 22 watts when on, and 21 watts in Standby. If using Option 1, you need to find out what channel your BT Vision box is using to send the signal via the aerial cable – Do this from Settings > General Settings> RF output channel) – then tune your TV into that channel number. More help on our “TV in other rooms” page. Engineering menu Despite getting a “no” from BT’s Helpdesk, we’re sure there must be some kind of secret engineering menu (there’s one with other boxes, such as Sky’s digibox). There must be one… but we haven’t discovered it yet. If you have, let us know? USB sockets The BT Vision+ box has two USB sockets – one on the front and one at the back. We’re not aware of any device or application that makes use of these sockets yet, and it doesn’t seem possible to use USB to connect a PC or Mac to the BT Vision+ box to extract recorded video from the box’s drive. As there’s no obvious use at the moment, we can only assume these are likely to have some use in the future – maybe a webcam, external keyboard or a USB memory card connector for photos. If you’ve heard of a use for these USB sockets, or feel free to speculate in our Vision forum. Consider signing up to our Vision newsletter for news of service enhancements. Known as the Philips DIT9719 Hybrid IP Freeview Receiver and Recorder, in February 2007 this was listed for purchase at AdvancedMP3players. It appears that this was listed in error and has now been removed from their site. We’ve been told that the only source of supply of this box, is BT. More on alternative IPTV solutions on our dedicated IPTV page. Can I transfer my saved recordings and pre-set timers to a new BT TV. I am thinking about swopping my sky box for the BT Vision HD etc. BT told me that if I get BT Vision and also buy Sky Sports 1 from BT AND I get their BT Extra box for the bedroom I cannot view Sky Sports for some reason. Do you think I could view Sky Sports if I simply use the RF output to my bedroom rather then their BT Extra box?